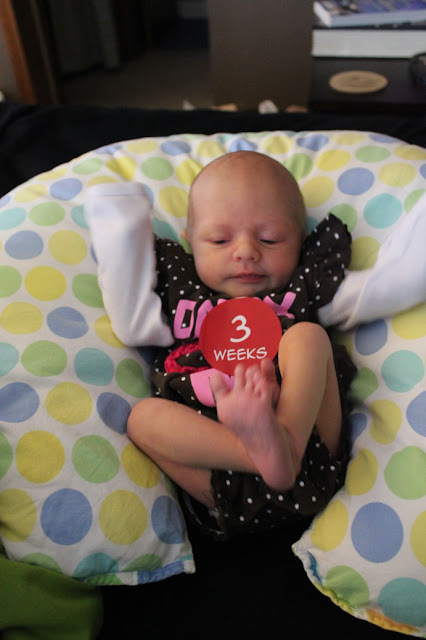 I can't believe you are already three weeks old! And the even more amazing part - today is your due date! 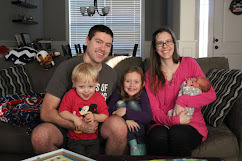 But because of the gestational diabetes you were going to join us one week early, and because you are independent and wanted to do things your way, you actually joined us three weeks earlier than your original due date. That's my girl! Now, if only you were independent with your sleeping habits. You definitely do things your way and your way involves being held almost 24/7. I love you my sweet girl, but I look forward to the day when you go down [easily] in your port-a-crib/crib. That will be a fantastic day for me! In fact, we'll celebrate. I'll eat something really good that way we both benefit! Speaking of feeding, we have been having a few struggles with feeding lately. For some reason you resist even though we both know you're hungry then finally you latch on and you feed for a good twenty-thirty minutes. Mostly life is good in the Evans household. Exhausting? Definitely. Frustrating? We have our moments. But also very very good. It's hard to believe that you are already almost a month old. Time is already flying right by us.